As a young boy Joe always wanted to be just like his two older brothers who both played high school football. However, it was Tom Roth who received a football scholarship to play quarterback for Washington State. 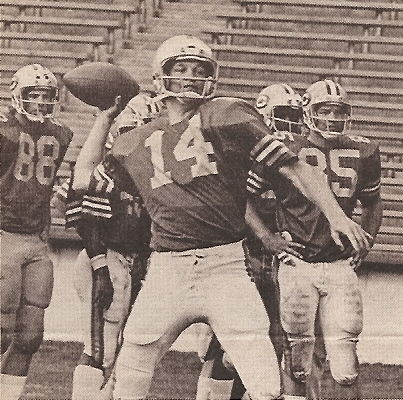 In 1965, Tom was the starting quarterback for the Cougars and as an 11 year old boy learning to play the game, Joe wanted to play quarterback just like his older brother Tom. Tom taught Joe how to hold the ball, drop back in the pocket, and release the ball quickly. Joe had never considered any other position. He wanted to be like Tom. During the four seasons Joe played at Granite Hills High School (1969-1972), Joe Namath was in his NFL prime. 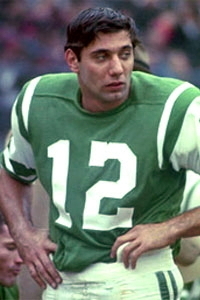 Joe wanted to wear #12 just like Namath. 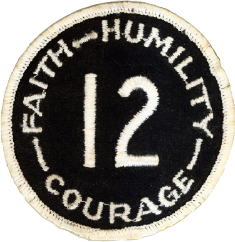 Joe wore #12 thru his high school career and during his time at Grossmont College. Ironically, several years later while playing for Cal, Roth’s quarterbacking skills would be compared to his NFL quarterback idol, Joe Namath. The comparisons went so deep that reporters and Cal fans often referred to Roth as "Telegraph Joe," a play off Namath's famous "Broadway Joe" nickname. When Joe accepted his scholarship to play football at the University of California his streak of wearing #12 faded. When Joe arrived on the Cal campus, three quarterbacks were vying for the job of replacing All-American Quarterback Steve Bartkowski, who in the spring of that same year was selected as the number one pick in the NFL draft by the Atlanta Falcons. Joe Roth was competing against junior Fred Besana and senior Mark Cahill for the starting quarterback spot. Mark Cahill, who transferred from Olympic JC in Bremerton, WA, backed up Bartkowski in 1974 and was already wearing #12. Joe was initially issued jersey #14. Joe felt odd looking down and not seeing his familiar #12 on his jersey. As fate would have it, by the end of spring football 1975, Mark Cahill decided to quit the team. Joe changed numbers to #12 and the rest is Cal football history.